What is Your Everyday China? Okay -- we've been showing our wedding china and sometimes our everyday china but let's devote this to just everyday. What do you use everyday -- day in and day out. Do you have more than one? And mix and match or use one for spring and one for fall? I have a problem with dishes as in I can't stop acquiring them. I have more dishes than anyone needs. My every day are white corell with a scroll type embossed rim. I never had wedding china other than the "gas station china" which was bought for 99 centers per place setting when you filled your tank. I still see those dishes at thrift stores. 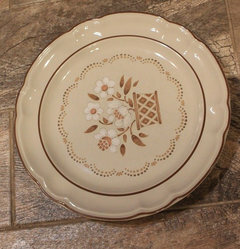 I also have many pieces of Hull brown and a set from my aunt which is a white porcelin from Spain. Also clear glass with a pine cone pattern, floral Haviland which I believe is Sandra pattern. This is not even counting the many sets of dessert dishes I own. When I moved about 7 years ago I got rid of probably 4-5 sets. I also love old restaurant dishes. 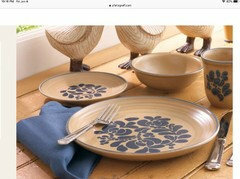 We have a Corelle pattern called Sand Art. I don't remember what I had previously but it was another set of Corelle. I would like some colorful Fiesta, but our cabinets are small and I'm not sure the Fiesta would actually fit due to their diameter. They're also thicker. I would also love some vintage atomic patterns, but I don't think they'd be DW safe and then also need to probably worry about lead paint. 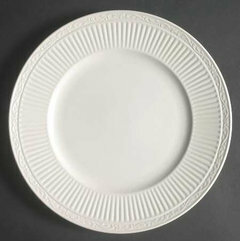 Salad plates are the same and then the bowls just have the peachy-orange trim and are white. Don't have any serving pieces. I saw it in a store in Bermuda and loved it and my kids surprised me with a set the following Christmas. Each piece is different. I use it every day. 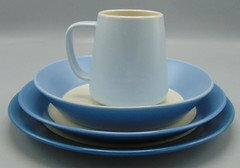 My everyday wedding pattern was a stoneware from Denby. I don't recall the name and a quick look at their site tells me it's discontinued. It held up pretty well, with the only casualty being one bowl in 15 years. I was never a huge fan of it, but my XH loved it, so I let it leave with him. 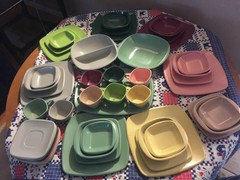 I had no other dishes and hadn't really planned for what I wanted, so I bought a set of vintage melmac dishes on Facebook Marketplace from a woman who was cleaning out her grandmother's house. It's Talk of the Town by Harmony House (i.e., Sears), ca. 1955, which seemed right for my house, which is ca. 1954. 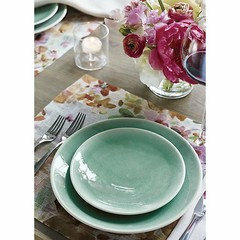 Eight place settings (minus two missing pieces) in eight different colors, plus serving pieces for $50. 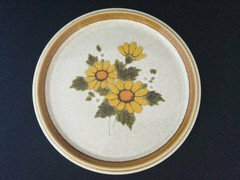 Groovy mid-century dishes acquired on the cheap in a Sprouts parking lot? How could I resist? I'm still afraid to put them in the microwave or dishwasher, which is cramping my style somewhat, and the bowls are tiny and shallow. I plan to look this weekend for a nice minimalist set for heavier duty use (I wish I were close to IKEA) and may just display the melmac. 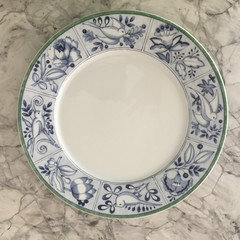 Registered for Dansk Rosebud and used that for many years but now have Hotel Collection white bone china --also some Villeroy & Boch pieces I mix with it. Lol...we are still using our Pfaltzgraff Folk Art dishes...bought them during my first year of teaching in 1985...I retired this year. Maybe they need to retire also. They have resided with us in three states and three countries though . Daisy S -- my BFF has these as well -- her first set she broke some, some had knife marks on the plates, she went to the Pfaltzgraff outlet to replace needed pieces and was told that they no longer made them so she got rid of them. Fast forward about 15 years and two sets of shoddy dishes later and she wishes she never got rid of them so for the last 3 years she's been on a quest to reacquire her set -- a piece here and there (well, maybe 12 plates here and 4 cups there). She's almost there. She questions why she didn't think of flea markets when she needed to replace pieces of her set. Of the three similar patterns -- Folk Art (the beige and blue), the brown on brown or the blue on gray) -- Folk Art is the most rare with the brown on brown being the most common. 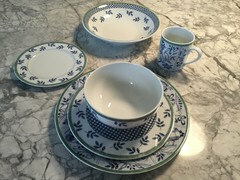 I bought my own *wedding* china...EJ Korvetts was going out of business and I got my chinese china at 50% off...bought two sets and they've been the staple of family gatherings ever since. I didn't dare buy *good* china as I knew between me and DH we'd just keep breaking them. The cheap stuff *never* gets broken. 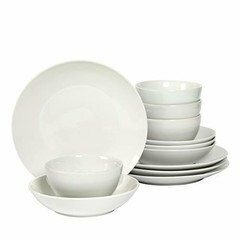 Our everyday china is corelle...and we've managed to break some of them over the years! I have 3 other sets of dishes from MIL and DH's grandmother...lots of plates, and saucers, only a couple of cups .... the rest were broken. My first everyday dishes were from a gas station. Everytime you bought gas you got your card punched and after so many punches you got a place setting. They have long been gone. Even forgot about them until this post. 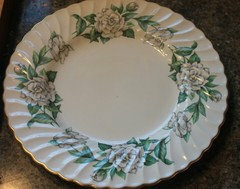 My next set was Johnson Bros. White Octagon Ironstone as shown in Martha's picture. 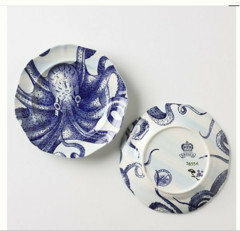 (Martha, seems we have similar taste both in everyday and good china.) 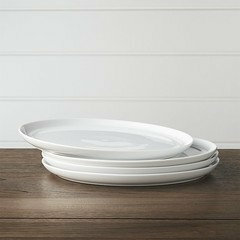 I loved the Ironstone but it was heavy and after some time and several kids, replaced it with Corelle. I still have some cereal bowls from the Corelle which I just removed several days ago from the cabinet and am getting ready to bring them to Habitat Restore. After the Corelle, I went to a Mikasa fruit design and now for many years I have been using Mikasa's Italian Countryside. Jakabedy. I LOVE your Melmac dishes!!!! Love everyone’s everyday dishes. I have “a thing” for china, the Lenox Chirp and Fiestaware have been calling my name for a few years now, but I have resisted. 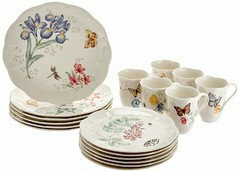 Have such a hard time leaving other beautiful expensive china sets for sale at thrift shops for a pittance, but just no room. 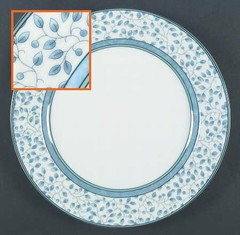 My wedding everyday dishes are Noritake Conservatory have 10 settings. Registered and received these at my wedding 27 years ago. Still love. 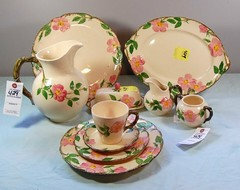 and my summer dishes which I inherited are vintage (made in California era) Desert Rose Franciscanware. Do not like the newer Desert Rose made out of CA, too thick and the detail of the flowers is not nearly as good. Love my vintage pieces. Have 12 place settings. Not at home so I used internet pics. I guess I am missing a gene or am too practical. China in the true sense of the word, to me means unnecessary cost and care. I'll stick with durable, cost conscious, Corelle or similar. And I have no desire for "silverware" that needs to be polished either. Give me stainless steel flatware. It can be just as attractive. When I was married 58 years ago, pricey China and Silverware were not on my gift list. C&B. Especially because you don’t have to buy them as a “set” — I like to mix and match. 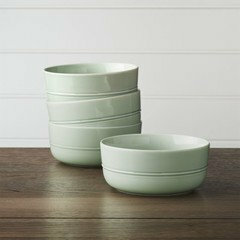 These are not the colors I have — I have all off-white bowls, but the plates I have are a mix of the off-white, light green and light blue colors. I also have a lot of handmade pottery bowls that we use a lot — wish I could replace all my dishware with pretty handmade pottery but it just wouldn’t be practical or budget friendly! I really like the C&B white and pastel posted right above. And the Lenox chirp is also amazing. I have always preferred stoneware to china.. but generally had a variety of china and stoneware for different occasions and moods. 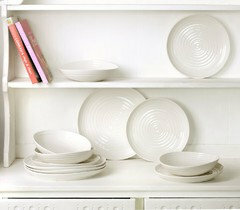 When I moved, I replaced my many sets with just one-- Sophie Conran's Portmeirion White. I chose this one because I loved the "extra" pieces-- the serving pieces. I don't care for or use the mugs but I love the rest of the collection. None of the pieces are completely round which gives them a kind of carefree style. 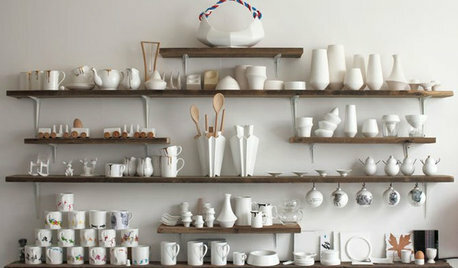 I love the simplicity and slightly offbeat nature of what is basically a plain white set. 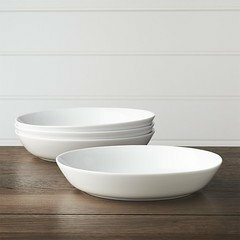 I have been building the serving pieces-- I have platters, roasters, casseroles, butter keeper-- and today I purchased the pasta bowls and a footed cake plate! 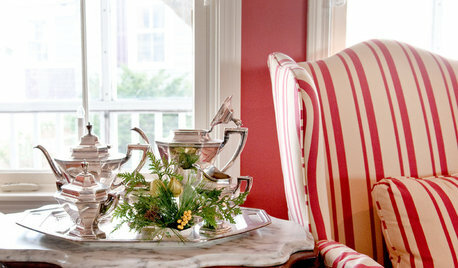 They mix and match with other pieces nicely and they allow me to use basically play with any style linens. Easy Peasy. Martha Scott, Pfaltzgraff still makes Folk Art...just go to their website ...I got rid of my mugs and cups saucers long ago...too clunky. 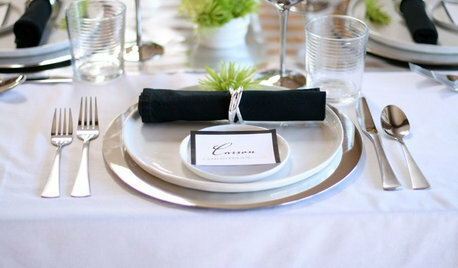 We have always loved the deep rimmed plates and soup bowls, but know they are way out of fashion. lenox butterfly meadow. durable as can be! freezer to oven to table. DW and microwave safe!! workhorse! we put these through the wringer and they still look brand new! have had over 10 years. can't break, scratch or chip them, they are just awesome. bought on clearance at one of their outlet stores... did not get complete set, just bought what we use, which is great for us!! 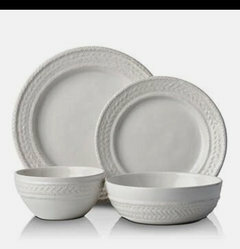 As I said in the other china thread, we have used stone wear as our everyday dishes. It is more durable and more us. First got a neutral color cheap set called "Oatmeal", than 10 years later a glossy black Corningwear stone wear set. 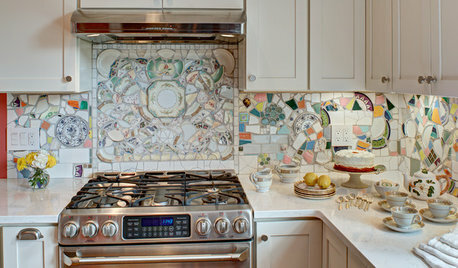 After the kitchen remodel in 2006 bought Pfaltzgraff "Silk Rose". It reminded me of my Mom's Franciscan "Desert Rose". I always loved the Desert Rose pattern. I have no idea what happened to her set of dishes when my mom passed. Stock photo of Pfaltzgraff "Silk Rose". My everyday China is juliska’s Le Panier”. It’s got a great heft and handmade look. 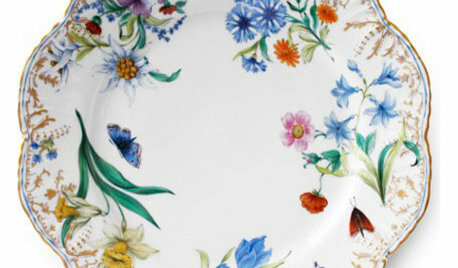 I saw a Mikasa Anabella dinner plate....and..remembered how much I loved looking at it! They only have one plate....maybe to set a cake on....in my cake dome? :0) I remember seeing a whole set @ A thrift store. The center of the plate was scratched badly and had silver streaks from knifes. Looked terrible. I love china! Didn’t post on the wedding china thread as we did not select a pattern 36 years ago. At the time, I already had service for 12 of Dansk Blue Bistro. We used this as our everyday china until 4 years ago. Still love it. 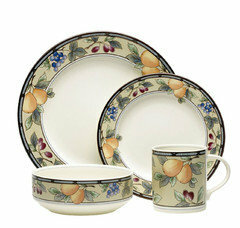 Our new everyday china is Villeroye and Boch Switch 3. Had admired this for many years. So glad to have it now. 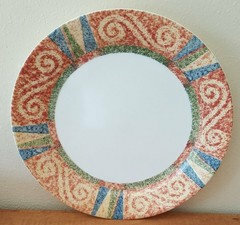 I also have 36 C&B white Aspen dinner plates and 24 salad plates that I use when entertaining a large group. My Mom always said to have white dishes and she was right. 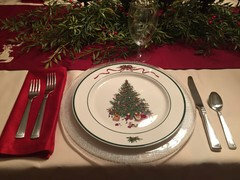 This time of year I bring out my Christmas dishes from Macy’s. Before she passed, my aunt gave me my grandmother’s Limogue china. It gets used on occasion. These were my everyday dishes as a new bride. There have been many sets in between, but these are the latest. And I love them! I am looking at my everydays, and realizing if I want to make the grade, I need to pick one, and complete the set. SO, here's my current hodgepodges, and I am probably working on more important things right now than getting my everyday china to match, but eventually... yes, I want to get there. HERE WE GO! I have 12 of these plates, and absolutely no idea where I got them. The thing is, they are ONLY the dinner plates, nothing else. I know I had them back in the 80s. Underside says: Stoneware by Hearthside, CUMBERLAND, Mayblossom, Japan. 6 dinner plates from a set called Mountain Wood Collection stoneware, Trellis Blossom, made in Japan, one large serving bowl, one soup bowl, 6 small plates. I donated the cups and saucers to families in need who'd moved onto a church property in my old area, after Hurricane Sandy, but there'd been eight of those. This set was bought for me by my parents at the Elephant Trunk Flea Market mid 90s. 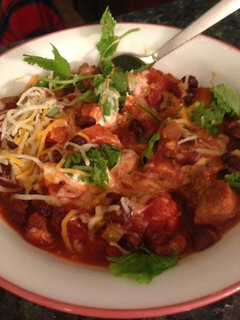 For soup bowls these days, I am using 12 plain white IKEA bowls that retailed two years ago at 99 cents each. I mean... none of the above choices had enough here resembling soup-readiness! What I need to do is find more china/stoneware in any one of the three above patterns, and run with it, to fill out my needs. Aesthetically, I like the Mountain Wood collection the best. 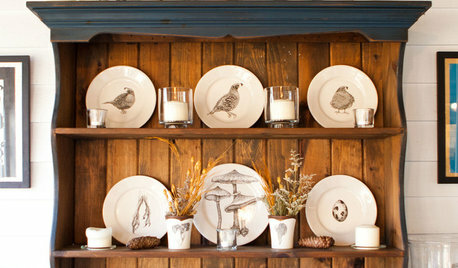 Wow, artemis, I remember having the Mountain Wood plates long ago when I lived in CT. Memories! OMG, there are so many dishes I love on here! I am dish-aholic too. I love setting a pretty table. 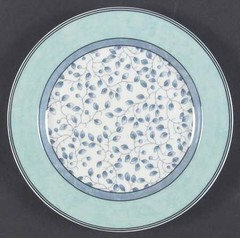 I would say the dishes I use the most, for breakfast, lunch and snacks, are melamine "Wrought Irony" from Savannah College of Art and Design. I planned to use them poolside outdoors at our old house, but I have ended up using them everyday too. 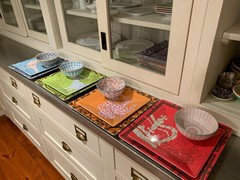 They are very colorful and love them paired with my Anthro bowls and a very crisp simple folded white cloth napkin. I liked how light they are and TBH they are the dish I always grab. I have had them probably 10-12 years now and they should be replaced, but I can't give them up yet. Here they are, with the bowls. I actually like to mix and match the plates. 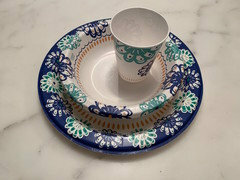 I did flirt with some place settings of this melamine, because i have a lot of blue in my home. I tend to use them when I cook an Asian meal but I don't like the shape really. 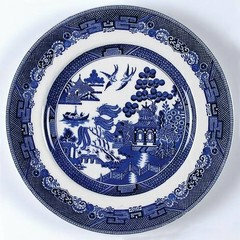 For family dinner, I usually use my everyday china, which is Wedgwood Countryware. This is most in keeping with my usual design MO; all white with some texture from the cabbage leaf design. Love these, I bought them on my first trip to England years ago. I also have some mustard colored stoneware (I had this at the lakehouse, where it fits the aesthetic) and many cut glass plates I bought at a Wms Sonoma outlet years ago to host a friend's bridal shower. Then there is my everyday dishware in Maine,unabashedly thematic. I mix three sets, dinner, salad and canape. Cannot find the salad plate JN. Daisy S -- my friend was at a Pfaltzgraff store about 15 years ago and they told her they no longer made it . . . she wanted to replace the few items that she had broken over the years but no dice. Glad to see that they've started making it again -- wonder why? 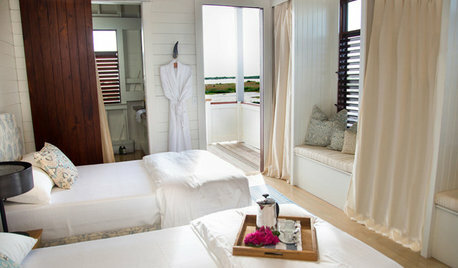 Does it fit with the farmhouse look that so "in" right now? Nichole -- that's my daughter's pattern and we always look for it and buy it whenever we see it if it's in good shape and reasonable. And yes, knives do mark it badly! Mtn, I used to have those SCAD plates too! They got really scratched up so I ended up donating them to goodwill. 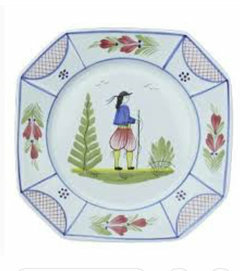 I like French Bull plates and platters, too. I forgot to mention that those are my "lunch/sandwich" plate of choice. OMG, Sue, now I remember you "saying" that before. I wish I could find replacements, there is something about them I just like. Artemis. 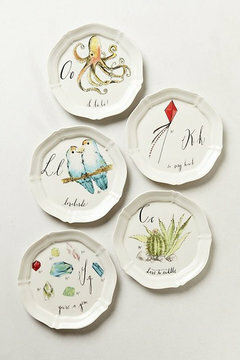 Your Gardenia plate looks so much like mine...Maybe exactly. Mine are packed but I plan getting them out one day. The bottoms say..*The Gardenia collection Saks fifth avenue * I've had them at least 30 years. My grandfather gave them to my mom and she gave them to me. My new Sur La Table Bistro dishes arrived today, none broken. They look nice and tidy in my cupboard. I do have some regret in not holding out for a pattern I liked after seeing all your pretty dishes. 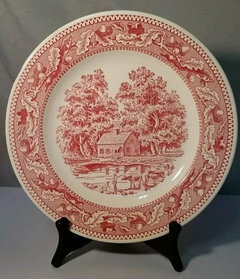 BUT, wouldn't you know, I went to an estate sale yesterday and there they had a lovely set of Royal Worcester china that looked like it had never been used and was just darling. It was only $175 for a set of 12 place settings. I stood there looking at them, thinking I could return the Bistro set when it arrived and use these. I didn't do it, though. I kind of regret it. I just don't have the room for an additional set of china. Why do things like this happen to me so frequently? Oh well, I am happy with the Bistro set. I was thinking about this thread today as I was washing up my dishes. "We" have enough dishes, mugs, glasses etc to feed a large family, and fill a dishwasher. Living alone now, do I need all that, taking up space. I love mugs, but since I only use a couple in a day, jeez. No sets, I'm not into sets I just buy whatever strikes my fancy at the time. 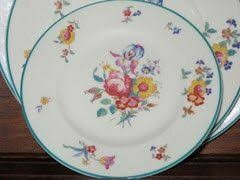 Artemis, I have those plates with the flowers from the 80's! this is kind of timely! When I was a young single, maybe 13-14 years ago, I was at an outlet mall, maybe in NH, can't quite remember. I found a set of Dansk dishes marked way down. Mine are more gray blue than this photo. I think there were 2 colors of blue. The set was not ideal for several reasons...The plates were super large, the bowls don't stack, the mugs are too big for a normal person to finish a cup of coffee (though my husband likes them). Through years of use many became chipped and the largest plates did not allow my cabinet door to fully close. We really only ever used the "soup bowls" (top plate in that photo) as a regular plate because we don't like big servings. So this weekend, at Costco, I picked up 3 sets of these for $14.99 each. The plates are all normal sized and the bowls stack nicely. My cabinet now closes all the way and they are taking up about half the space. They are a more appropriate size for my young kids. And at that price, if they chip I won't be upset. 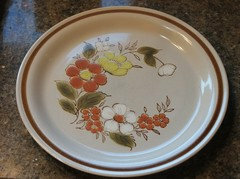 Our first dishes were some my mother got with coupons she collected from Safeway grocery store. They were stoneware, had brown edging and pretty blue flowers that looked like water colors. They were worn and crazed and chipped after 22 years of hard use (not to mention the set was getting too small from breakage). 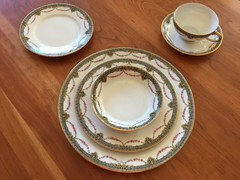 We also have some Mikasa china with gold trim that belonged to DH's grandma. I have it in a cabinet for DD if she wants it eventually. China is beautiful, but not really my style. When I married 20 some odd years ago, we started off with a Pfaltzgraff pattern with pink flowers. I was 18 at the time and my tastes were all over the place and we were broke. Later, the Pfaltzgraff was replaced with all white dishes from Pier 1. They were a bistro style and they worked well for our lifestyle and were not soooo expensive that if they broke I would be terribly upset. The rims made them a bit larger than I would have liked but it was a minor flaw. 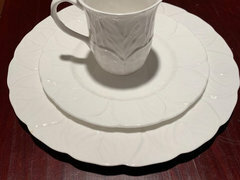 I also found some lovely John Haviland white dishes at an antique store. I adored them and had visions of hunting for more. Unfortunately, this area is just not set up well for that type of search and ebay prices were beyond what I was willing to pay. I am still unwilling to let go of the pieces that I have though, just in case. Now my everyday china is Fiestaware. I am limiting myself to the colors of scarlet, cobalt and lemongrass. 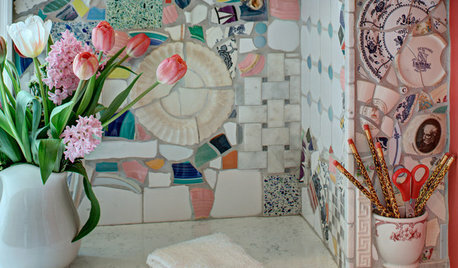 These colors coordinate well together and cover a wide range of decorating options. I love the numerous pieces that are available such as the mini casseroles, fruit bowls, tortilla warmers, the salsa bowls are the perfect size for many things, etc. I also like that they can all go in the oven. I am getting a bit restless though and considering some more accent pieces to go with the sets. Maybe some patterned salad plates or something. Quasifish, my sister's first dishes were the wheat pattern dishes from boxes of Duz detergent, handed down from my mother. Mom also had two different patterns of glassware from Duz -- I still have about half of the gray "Swedish modern" set. I love those glasses although I would prefer a color other than the dark gray -- but I love the feel of them in my hand, the shape, size and weight are perfect. Especially the juice glasses. Since becoming a widow, downsizing tremendously from a 4 bedroom home to a 2 bedroom apartment, I’ve discovered my dining needs have greatly changed. I no longer had room for the massive quantities of china and pottery that I owned. Since my daughter is using/storing my huge antique china cabinet and long sideboard, I gave her my service for 12 of formal Sryacuse “The Hostess” fine china, as she now has the room to store it. I’m using my antique Waldorf Flow Blu pottery shown in the second photo for everyday use, and my antique Flow Blu Burgess & Leigh Middleport Non-Pariel pottery for gatherings of more than 4. 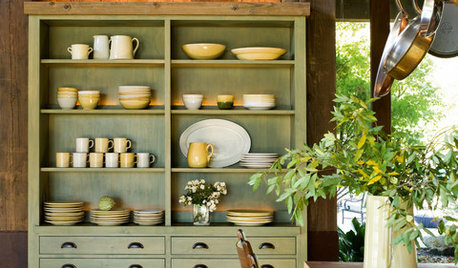 I realize this is slightly unconventional, however I’ve always loved this antique pottery and I have plenty of it. It goes in the dishwasher, and even the microwave, and is still in perfect condition. Amazing that something over 140 years old can hold up so well! I had a lovely white china collection from The Palms that I had been using for every day use, that was donated to my niece who was just setting up her first household. 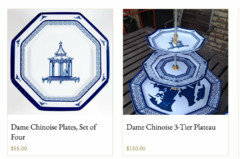 raee_gw I wasn't familiar with the dishes you mentioned, so looked them up on google- then they did seem familiar, and it looks like they are still loved and popular. My mother collected the dish sets when us kids were little. My brother had a smaller set from a different grocery store, but one that had a fair amount of value later on. I can't remember what the pattern was called, but it had to do with Americana. I still have the platter and the best dinner plate from my set- to use as a cake plate. Being short on room, and since they weren't in great shape, I donated the rest of the dishes on. The set had the short cylindrical coffee mugs that were popular in the 70s and early 80s. I loved those and now wish I had kept one or two, though we are drowning in mugs as it is. Oh well, there's always ebay if I ever get nostalgic! First I was given a red transfer set, it looked pink to me & gave it away about a yr later. Then I got Wilton Armatale. Loved it, looked like pewter, oven proof even under the broiler. Our second home we put a DW in & discovered the one thing my plough tavern Armatale couldn't do, go in the DW. It turned it very dark. Cleaned it & it is displayed in my corner cab. Now I have sandstone Corelle. 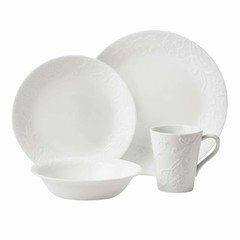 My china is Lenox Weatherly, off white with with platinum ring and I put it the DW have for years with no problem. My first set of everyday dishes were the same Mikasa as clt3's. There have been quite few sets (and many years) since those...some from a NYC supermarket, Waldbaums. My current set, and the set I’ve had the longest, is another Mikasa set, Garden Harvest. They do show silverware marks which mostly clean up with Barkeeper,s Friend, but the dishes seem quite sturdy and I’ve had them for several years. My collection has been added to by my sister who doggedly pursued extra pieces to the set all over the eastern seaboard. 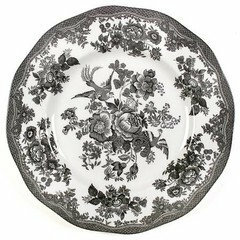 My aunt gave my sister service for 4 of Royal Ironware Memory Lane transferware. She then gave it to me and we still use it. It’s from 1965 and I love it. When DH and I married, we registered for Johnson Bros. Asiatic Pheasant in black. Still use and love it. I’d like to get more of it but it is now made in China so I’d like to get vintage pieces. About 10 years ago we purchased Juliska Country Estate pieces. 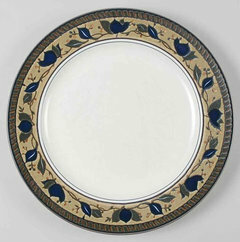 We have dinner plates, soup bowls, and dessert/side plates, as well as some serving pieces. I still adore the pattern but it hasn’t worn as well as our other sets - you can see knife marks which drives DH crazy. All three sets in constant use. None of wanted the “angry” faced ones, lol. (Some plates had more relaxed faces than others. We had the women plates too.) still my favorite plates. Jojoco, my mother and I went to Quimper in 2001! Love those plates. I love Juliska and Quimper. Oh, to have more space! My everyday are Mikasa Italian Countryside. 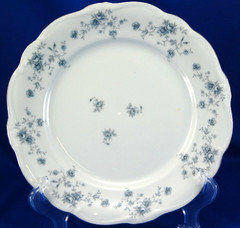 Special occasions are Haviland Blue Garland, I have a full set with serving pieces, collected over the years. I also have some Johnson Brothers Blue Willow that I love. Theclose - I just came over here from the Replacements site, where I was looking at the pink Memory Lane, which I love! 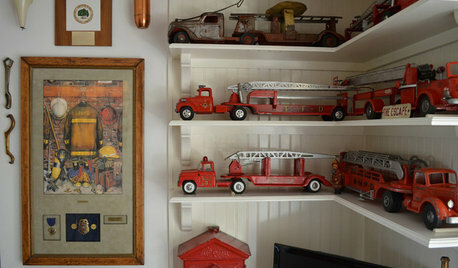 I inherited Johnson Bros Colonial America from my mother and am thinking that Memory Lane might be a nice addition. That pattern brings a smile to my face. 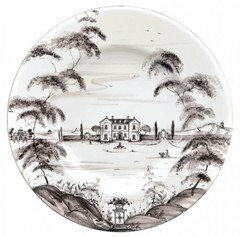 Regarding the problem of being manufactured in China, Replacements lists the country of origin on its transferware, either Britain or China. 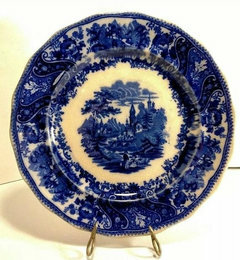 Items from Britain are still available, TG, because posters on the site are complaining about the inferior quality of transferware coming from China. I wish that my mother could see this thread. She would be amazed to learn that simple things she treasured 80 years ago are still going strong! 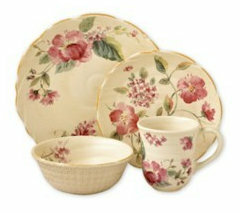 I can’t believe I’m going to say this but… Last summer I got rid of a whole stack of “memory lane” Juliana dinnerware. I had bought it at a tag sale and had too many other sets at my summer house. I donated it to the Goodwill drop off center in Guilford, CT. Cleary, I didn’t know what I had! I hope I made someone very happy with my donation. As an aside, I’m pretty sure I kept a platter and a covered casserole… I will know when I open my cottage in May. Oh Jojoco! But I am sure that yes, you made someone happy! 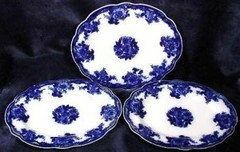 Saypoint -- that Haviland was in our grocery store in the 70s and I bought them having just ironstone at the time. There was also a pink one as I recall. What's more important a sale or everyday low price? Open Shelving or Traditional Cabinets? Help me stop moving furniture everyday! Let's start a Chain Reaction Game! Get some activity going here. What's with the internet stories you have to click "NEXT"
did anyone watch "Jesus - His Life"? Boy ,it's hard to find shoes for me . 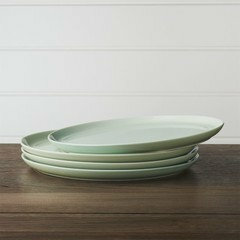 Mio Deep Dessert Plates, Set of 4, Agave Green, 8"
Mio Dinner Plates, Set of 4, Agave Green, 11"